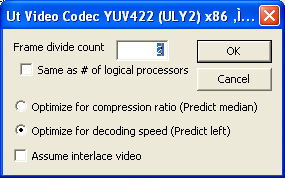 Ut Video Codec Suite is a new free-software lossless video codec for Windows which Takeshi UMEZAWA has developed. It's implemented as a VCM codec (also called "VfW codec"). It can currently encode YUV422 and RGB sources. ULxx: Speed up encoding to / decoding from native packed formats. ULxx: "Assume interlace video" is now non-recommended feature. Deleted information in readme about QuickTime components, which are already discontinued practically.